So you have the cute bracelet, the fun traveling case-- the whole shebang...but you're not quite sure about this fancy new lava bracelet with the oils. You're not alone, and we've got you covered! Here's the scoop, how to use them and why we love them! Carrying essential oils around during the day can be cumbersome, bulky and inconvenient. Our lava bead bracelets will decrease the need to tote around your oils while still receiving their benefits on the go! 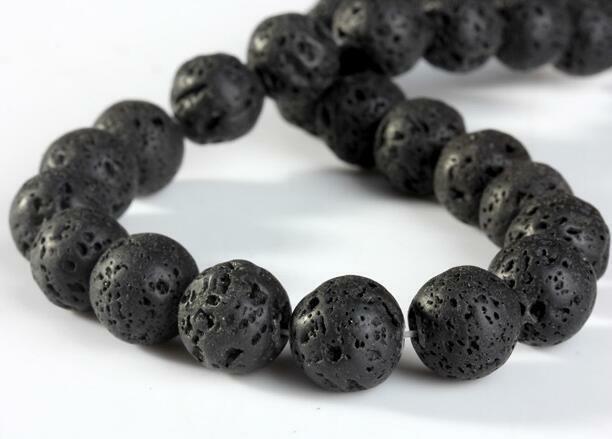 Lava stone beads are made from the cooled, once liquid, molten lava rock known as basalt. The molten lava moves down the sides of the volcanic mountain and into the ocean cooling it rapidly. Through the cooling of the lava into the ocean, dark, bead-like structures filled with crevices and pores are formed. The porous structure is created from gas bubbles which once occupied space within the liquid lava, prior to cooling. These naturally formed beads are popular in jewelry making because they are exceptionally light, economically responsible and multi-purpose. Lava stone is popular amongst essential oil users because of it's physical composition and weight. The porous structure of the bead specifically makes it a good medium for absorption and therefore increasing the longevity of the oil. Additionally, this allows for hands-free essential oil use with a touch of style that's feather light. There is no additional hassle of transporting oils when you integrate a lightweight, lava stone bracelet into your daily outfit ensemble. Regardless of which brand of essential oils you use with your diffuser bracelet, the oil application is quick, easy and painless! First, choose your favorite oil (diluted in a carrier as indicated) and gently rub 1-2 drops directly onto the lava stones. (Not the metal, it will not absorb). - Fingers or cotton swab works fine. Depending on the type and amount of oil used, allow the oil to absorb into the rock for 30 seconds-1 minute as needed. Reapply oil when you notice the scent is no longer aromatic. You cannot hurt the bracelet! You can only hurt yourself! DISCLAIMER: Not all essential oils are created equal. Some oils may be used for cleaning and not stain, discolor or alter anything in your entire home. Other oils may remove the dye instantly from your favorite new tunic. Because of the varying forms, concentrations and exponential possibilities, we always suggest that you test your final oil in an inconspicuous location on items that may be ruined to ensure it will not stain, discolor or alter your clothing in any way prior to application of oil to the bracelet. You can also use your favorite perfume on our lava stone bracelets! It's been documented that scents/aromatherapy while using our lava beads lasts about 4x longer than oil/perfume without lava beads. Easily integrate these essential oil bracelets into your everyday attire! Not only will you benefit from the oils - you'll look complete and trendy in the process. Adorable, functional and convenient! Please use essential oils with caution. They are extremely concentrated and potentially hazardous. Always consult a health professional prior to using or treating yourself or others with essential oils. Use of essential oil jewelry is NOT indicated for children. Please contact a licensed Aromatherapist with any questions, advice or concerns regarding essential oils.